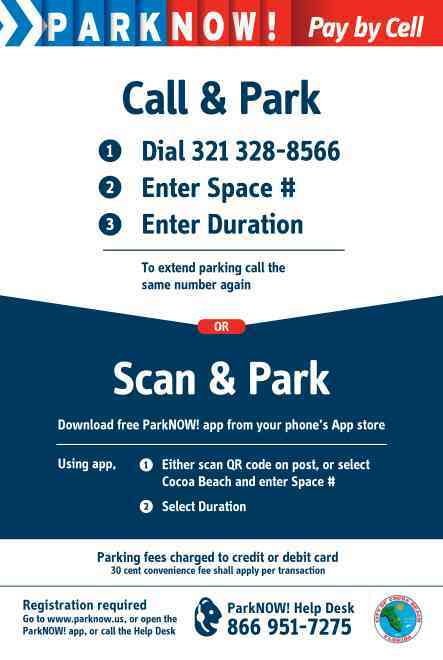 The City of Cocoa Beach announced that it has partnered with ParkNow! 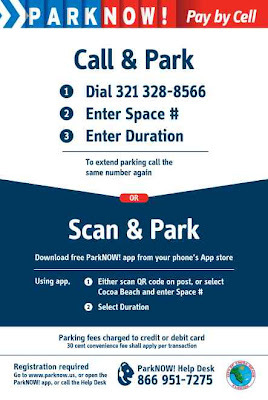 to carry out the “Pay by Cell Phone” parking system for approximately 200 non-metered spaces in the Cocoa Beach downtown area between North & South 1st Streets and the spaces in the City Hall parking lot. Motorists will be able to recognize the locations by the green curbs and instructional signage. Additionally, the 30 parking meters located at the beaches of North & South 1st Streets will accept payment by cell phone as well as coin payments. Customers are offered several ways to pay by cell phone. Android and iPhone owners can download the free mobile application. Another option is to pre-register at www.ParkNOW.US or call the phone number posted on the street signs and make payment arrangements. · Metered Beach Parking - $1.50 to $2.00 per hour, 24 hours per day, all year. The credit or debit card will be charged for the amount of time requested, along with a small convenience fee of thirty (30) cents that is paid to the credit card processor. For City of Cocoa Beach annual parking permit holders, parking is free. Persons wishing to get an annual parking permit can purchase them at Cocoa Beach City Hall between the hours of 9:00 a.m. and 5:00 p.m., Monday through Friday. The cost is $10.00 for residents and $60.00 for non-residents. There are several privately operated paid parking lots in the downtown available for those who do not want a permit, and do not wish to use a cell phone to park. By adding this new payment system, the City expects to increase customer convenience. Customers can pay to park for longer blocks of time at once, and remotely add time to their parking space. Additionally, improved compliance with parking regulations is anticipated because the cellular phone can be used to prompt the customer when additional payments are needed. In the coming months all metered parking will accept both coin and cell phone payments and additional on-street pay by cell parking spaces will be added. To launch the new system, City personnel and vendor representatives will be on-site outside of Cocoa Beach City Hall on August 3rd at 2 PM to demonstrate the system and answer questions. For more information, visit www.cityofcocoabeach.com or call 321-868-3219.